One spring day in 1997 a fluffy three-week old owlet tumbled from her nest high in a pine tree in Antigo, Wisconsin. Her resulting wing injury was a mixed blessing, leaving her unable to ever live in the wild but destined for a cushy life in captivity. Alice the Great Horned Owl found permanent employment at the small Houston Nature Center in Houston, Minnesota. She commutes to work as most humans do, residing in the home of her handler, Nature Center Director Karla (Kinstler) Bloem. Due to the timing of her injury, Alice grew up thinking she is a human so she considers Karla to be her mate. "I really had no idea what I was getting into," Karla chuckles, referring to the day she picked Alice up from the Raptor Education Group, Inc. in Antigo. Alice has opened a window between humans and her kind thanks to this close bond. She is the leading subject in the first vocal study on her species. 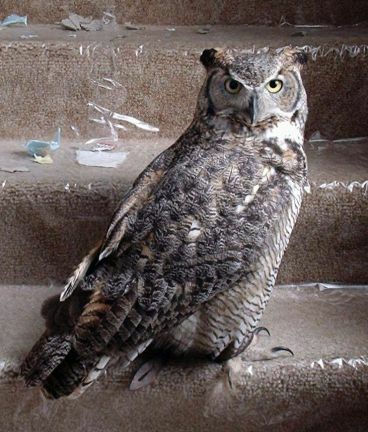 She is also the owl behind the 2005 law change to protect Great Horned Owls in Minnesota. The International Festival of Owls, which attracts roughly 1,000 people annually from around the world, had its humble beginnings simply as a "hatch-day" party for Alice. Due to the success of the Festival, plans are currently underway to create a North American Owl Center in Alice's hometown of Houston, MN. Somewhere along the way Karla realized that Alice was a very special owl. Through her Owl Festival contacts she began hearing of other owls who were special individuals just like Alice, who with their human handlers were doing great things for owl-kind. This realization, based on Alice, sparked the genesis of the World Owl Hall of Fame, so it's only fitting for Alice to enter the Hall of Fame by winning the Lady Gray'l Award. On a moonlit night in 1967, an Eastern Screech-Owl landed on the pup tent of a young boy camping along the Blue Earth River in southern Minnesota. The boy sat motionless and spellbound, watching the vibrating throat of the owl's silhouette through his tent as it trilled and whinnied. The owl conservationist in David H. Johnson was born. Since that fateful night nearly half of North America's 19 species of owls have found themselves the subject of David's research. Most notably he shouldered the role of being the first Spotted Owl Coordinator for the state of Oregon. This led him into the expert witness seat in the courtroom no less than six times during the hotbed of the Spotted Owl/logging controversy of the 1990s. He was rewarded with several commendations, including a Special Commendation from the U.S. Secretary of the Interior, the highest civil service award given to non-Interior Department employees. Thinking big comes naturally to David, so in 2002 he founded the Global Owl Project and has served as its Director ever since from his home in Alexandria, Virginia. The Global Owl Project is a team of 450+ researchers from around the world working together to conserve the planet's owls. Current research endeavors include survey techniques, genetics, vocalizations, morphology, distribution, and human cultural biases toward owls. Those cultural biases hold a special allure for David. He is planning to work with the Smithsonian Museum of Natural History to develop a "Spirit Wings – Owls in Lore and Culture" traveling exhibit intended to reach millions of people around the globe. David will most certainly keep his finger in the world's owl pie until his spirit flies off to meet the great owl in the sky, which we hope will be in the far distant future. Colin Shawyer's life with owls had its inception over 30 years ago, as he watched the once familiar Barn Owl disappear from his childhood haunts in Britain. 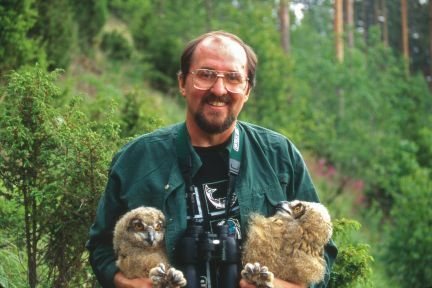 Spurred by a call to action by 2007 World Owl Hall of Fame Champion of Owls award winner Tony Warburton, Colin undertook a survey to determine the extent of the species' decline. Six years later the results of Colin's work were in: the Barn Owl had suffered a shocking decline of 70% in its population between 1932 and 1985 in Britain and Ireland, leaving the species vulnerable to extinction. A nationwide effort was needed to save the species. 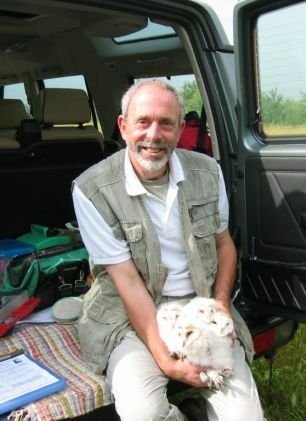 In 1988 Colin founded the Barn Owl Conservation Network, a nationwide team of Barn Owl enthusiasts across the UK, which he still coordinates to this day. In partnership with others, the Network has proudly achieved its goal of a viable and healthy Barn Owl population through habitat restoration and nest box erection. Besides Barn Owls, Colin delves into research and conservation efforts on behalf of several other species including Long-eared Owls, Little Owls, and Tawny Owls. He also supervises and supports PhD students and has authored several books. The International Festival of Owls is a fundraiser for the International Owl Center and the Center’s biggest event of the year.